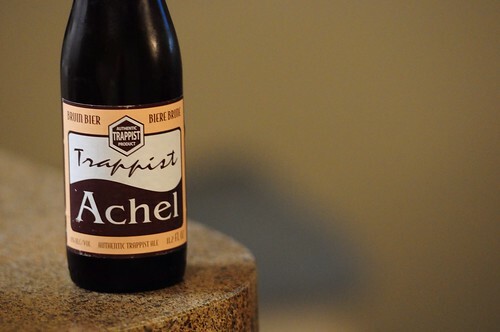 Trappist Achel 8° Bruin, originally uploaded by adambarhan. A: The pour is a rich amber color with about one finger of head. S: The nose is quite complex with yeast, caramel, dark dried fuits, and floral notes as well. A very complex nose. T: Sweet caramel malt and plenty of dark dried fruits. There is some mild spice (clove is what I mostly notice), and a little yeast as well. M: Medium bodied with a high level of carbonation and a dry finish.